A 60 ml pot with camo lid. 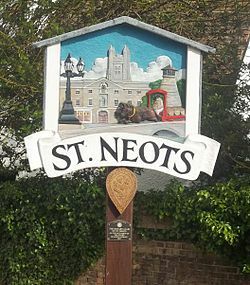 St Neots /sɨnt ˈniːʊts/ is a town and civil parish in the non metropolitan county of Cambridgeshire, England, within the historic county of Huntingdonshire, next to the Bedfordshire county border. It lies on the River Great Ouse in the Huntingdonshire District, 15 miles (24 km) west of Cambridge and 49 miles (79 km) north of central London. St Neots is the largest town in Cambridgeshire (Cambridge and Peterborough are both cities) with a population of 40,000. The town is named after the Cornish monk Saint Neot whose bones were subject to translation from the hamlet of St Neot on Bodmin Moor on consecration of the Priory of St Neots c.980 AD. Pilgrimage to St Neots brought prosperity for the town, and it was granted a market charter in 1130. In the 18th and 19th centuries, the town enjoyed further prosperity through corn milling, brewing, stagecoach traffic and railways. After the Second World War, the town and its industry grew rapidly as London councils paid for new housing to be built in the town to rehouse families from London. The first London overspill housing was completed in the early 1960s. Today, St Neots is a thriving market town and an attractive destination for tourism. A range of bed and breakfast hotels are supplemented by larger chain hotels to the west of the town, and one of the UK's largest inland Camping sites is situated on the banks of the River Great Ouse. Remember: No Signey, no Smiley - Bring a Pen! The cache is near but not on the village sign so there is no need to go climbing all over it. There is parking nearby in the market square.